People love to look at fish. Doesn’t matter if it is a 10-gallon tank in one’s bedroom or a museum exhibit the size of a small lake. 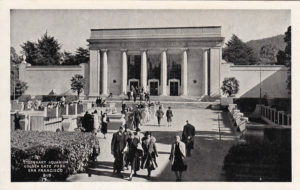 The people of San Francisco got their first chance to enjoy fish watching on a grand scale when the Steinhart Aquarium opened its doors on September 29, 1923. The aquarium building was damaged by an earthquake in 1989, and attempts to bring it up to modern standards were eventually abandoned. In 2005, the building was demolished and replaced by a new, dramatically different structure that opened in 2008. The new building, which also houses the other divisions of the California Academy of Sciences and cost $500 million to build, is the first and only LEED-platinum certified museum in the world. It won the Honor Award of the American Society of Landscape Architects in 2009. The building’s concept was to lift “up a piece of the park and put a building under it.” The 2.5-acre structure mimics San Francisco’s seven hills with a massive living roof capped by three green living domes. Holding more than 1.7 million native California plants, the roof and related structures save up to 2 million gallons of runoff per year. The entire building is surrounded by a canopy that holds 62,000 photovoltaic cells, offsetting 450,000 pounds of greenhouse gas emissions annually. But what is inside the aquarium remains the reason to visit. It contains nearly 40,000 living specimens of 900 species. A Philippine coral reef is 25-feet deep, topped by a mangrove wetland. A three-level tropical rainforest is home to free-roaming birds, butterflies, amphibians and reptiles. A colony of African penguins delights young and old. And, of course, Claude, the albino alligator, remains on the bucket list for all visitors. American Society of Landscape Architects. 2009. ASLA 2009 Professional Awards, General Design Category. Available at: https://www.asla.org/2009awards/111.html. Accessed September 28, 2017. California Academy of Sciences. Steinhart Aquarium. Available at: https://www.calacademy.org/exhibits/steinhart-aquarium. Accessed September 28, 2017. California Academy of Sciences. 2013. History of the Steinhart Aquarium (Steinhart Aquarium 90th Anniversary). Available at: https://www.youtube.com/watch?v=mcbgVTZWiiM. Accessed September 28, 2017. Evermann, Barton W. 1920. Steinhart Aquarium, California. The American Angler, 5(1):19-20. Available at: https://books.google.com/books?id=1EcZAQAAIAAJ&pg=PA19&lpg=PA19&dq=ignatz+and+sigmund+steinhart&source=bl&ots=D-9LwnDOZk&sig=0fyk_vOvJCPnvPqIpJLR41U7GJ4&hl=en&sa=X&ved=0ahUKEwiB58LJnsjWAhUIrFQKHW4fBM8Q6AEIWTAQ#v=onepage&q=ignatz%20and%20sigmund%20steinhart&f=false. Accessed September 28, 2017.